Above: This bright, custom kitchen is done in creamy white tones with a natural limestone floor and Giallo Ornamentale granite. 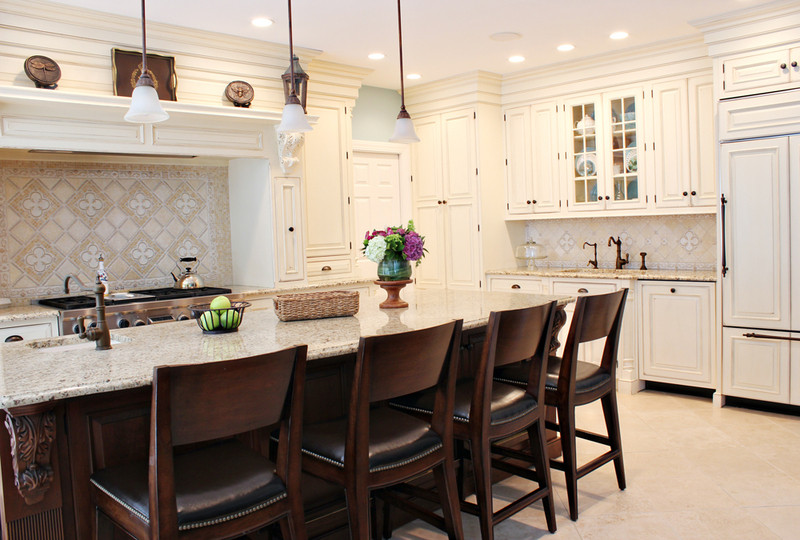 Above: An oversized island provides ample seating. 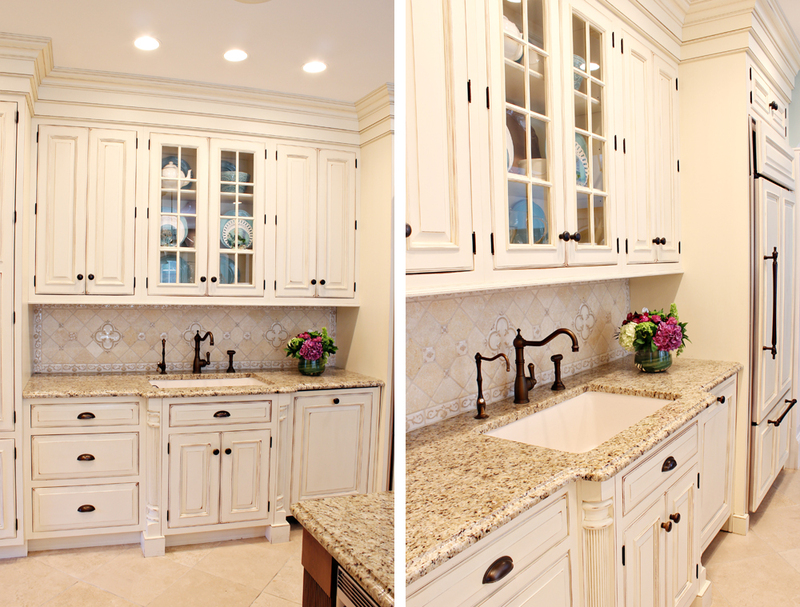 Left: Glass front cabinets are ideal for display pieces. A dishwasher is concealed behind a custom panel. Right: An extra wide farm sink is supported by reeded posts and is flanked by the custom, built-in subzero refrigerator. 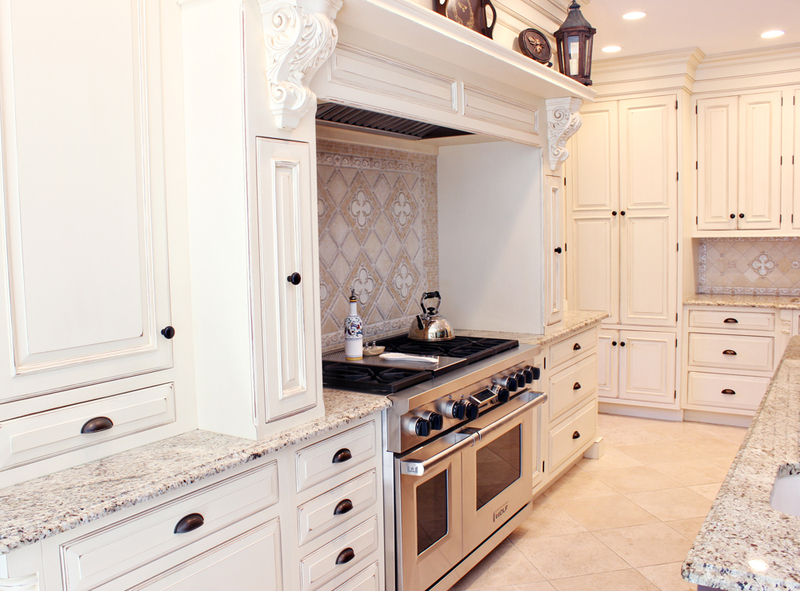 Above: The mantle hood features carved corbels, pull out spice racks and a Wolf 6-burner stove. 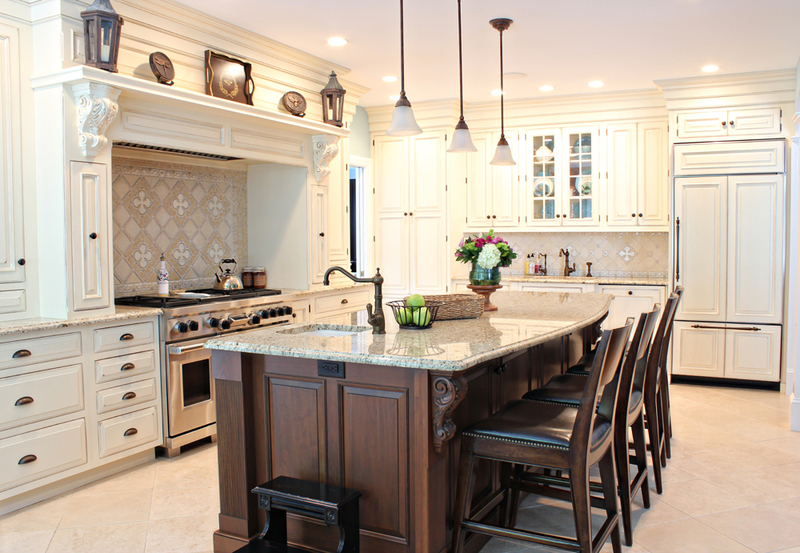 Top Left: The backsplash over the stove is tiled in custom glazed, handcrafted tiles in an intricate quatrefoil pattern. 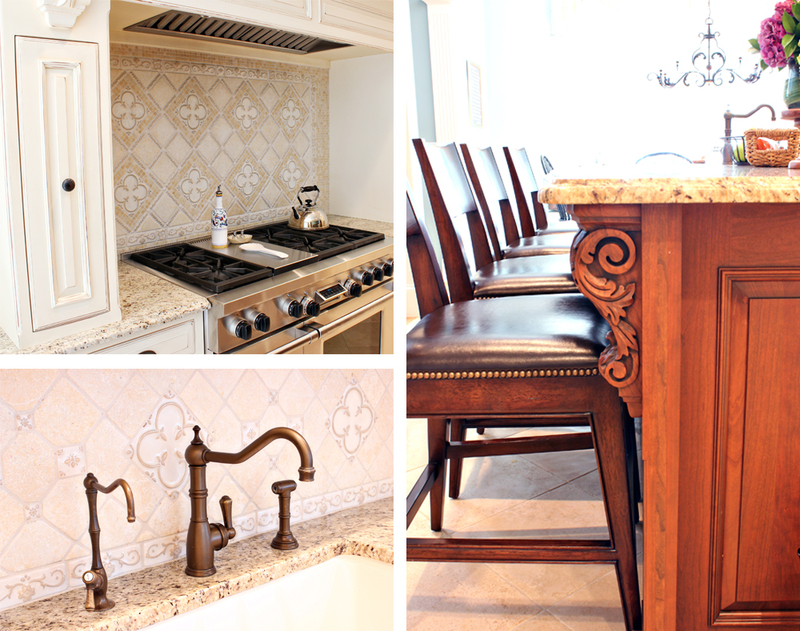 Bottom Left: The French style faucet has a living finish which produces a beautiful patina over time. Right: The substantial island features turned corbels. Counter stools are trimmed in brass nail heads. Left: A farm table and window bench with cozy pillows provides the perfect setting for family meals. Right: The iron chandelier has a unique oblong shape. Left: Detail of the farm table. Top Right: The window treatments are done in an embroidered cherry blossom fabric. 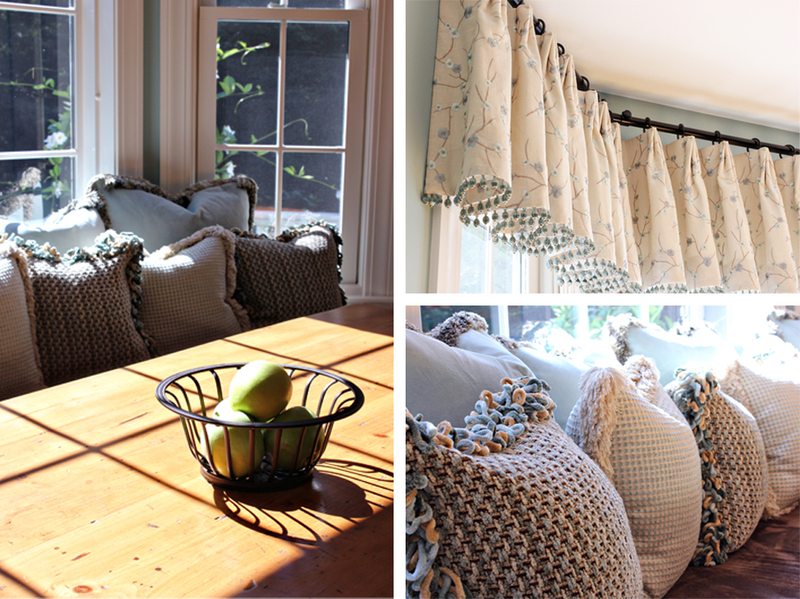 Bottom Right: Soft, comfy pillows with chenille fringe line the window bench.